Biography of German Baroque Sculptor, Berlin Architect. One of the greatest Baroque sculptors in Germany, Andreas Schluter was also an outstanding architect. Active mainly in Berlin, he played a major role in helping to establish the city as an important centre of German Baroque art. Influenced by the great Italian sculptor Bernini, as well as Michelangelo and Francois Girardon, Schluter's most famous sculpture is his bronze equestrian statue of Frederick William the Great (1689-1703, Schloss Charlottenburg, Berlin). Born in Hamburg in 1664, little is known of Schluter's early life and training in the art of sculpture. What is clear is that he showed a talent for stone carving, bronze casting and stucco relief. His first known work, decoration of the facade of St Johannis Chapel, Danzig, was carried out in 1681. It appears he was artistically active in Warsaw between 1689 and 1693. The quality of Schluter's work was recognised in court and in 1694 he was recalled to Berlin as court sculptor to Frederick III. It is primarily for the period of time Schluter spent in Berlin with the Hohenzollern Royal family that he is known. 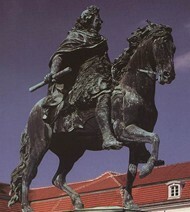 In 1697, Schluter unveiled his bronze statue of Frederick III (Kaliningrad) and six years later his equestrian statue of Frederick (Schloss Charlottenburg, Berlin) was inaugurated. Both works are spectacular examples of Baroque art and were symbolic of grandiose political absolutism. His style at this point showed marked Italian influences, his fine modelling and dramatic carving is reminiscent of Bernini. Schluter did in fact travel to Italy in 1696 and studied the Italian masters as well as earlier works of antiquity. Decorative sculptures on the facade of Wilanow Palace (after 1681, Warsaw); Sculptures on the pediment of Krasinski Palace (1682, Warsaw); Altar and crucifix, Wegrow Church (1688, near Warsaw); Sepulchral funerary sculptures of the Sobieski family (1692, Zhovkva), Altar at Czerniakow Church (1690, Warsaw); Portrait of Bishop Jan Malachowski (1693, Wawel Cathedral, Krakow); Pulpit (1703, St. Mary's Church, Berlin); Sarcophagi of Friedrich I and Sophia Charlotte (Hohenzollern Crypt of Berlin Cathedral). Schluter was also a gifted designer and is ranked among the greatest architects of the Petrine Baroque - the name applied to the style of Russian architecture founded under Peter the Great used in the buildings of his new capital, Saint Petersburg. Other proponents were Mikhail Zemtsov and Domenico Trezzini, and all drew their inspiration from modest Dutch, Swedish and Danish architecture, rather than the more traditional and dramatic Byzantine style. In order to appreciate important 3-D artists like the German Baroque sculptor Andreas Schluter, see: How to Appreciate Sculpture. For later works, please see: How to Appreciate Modern Sculpture. Schluter's most famous architectural work was the Berliner Stadtschloss (1702), which was the principal winter residence of the King of Prussia. Unfortunately it was heavily bombed during World War II and later demolished in 1950. Fortunately Schluters sculptured keystones from the arsenal, including a series of dying warriors, survive as a testament to his mastery. In recent years the German government voted to rebuild the Schloss. Work commences 2010 and off-site stonemasonry has already started. Schluter worked as Hofbaumeister in Berlin (Court Architect) and helped design many state buildings. Between 1702 and 1704 he also served as Director of the Academy of Fine Art and had an immense influence on artistic life in Berlin at the time. However, his career came to an abrupt halt in 1703, when one of his designs, the water tower of the Berlin Mint looked like it was about to collapse. It was discovered that several of Schluters other designs also had serious structural issues. (Now believed to have been the result of marshy ground). Although Schluter blew up the water tower himself and sought to rectify his errors, his enemies gathered at court. He lost one office and job after another and was eventually only allowed to work as a sculptor. The disgrace destroyed his equilibrium. In 1713 he was offered work by Czar Peter the Great in Saint Petersburg. He was able to start work on several buildings, including Kikin Palace and relief stuccos on the Summer Palace. However he died not long after his arrival. Schluters work in Berlin influenced the architects Fischer von Erlach (one of the last great architects of the Renaissance and Baroque periods); Matthaus Daniel Poppelmann and Georg Wenzeslaus Freiherr von Knobelsdorff.  For the history and types of sculpture, see: Homepage.